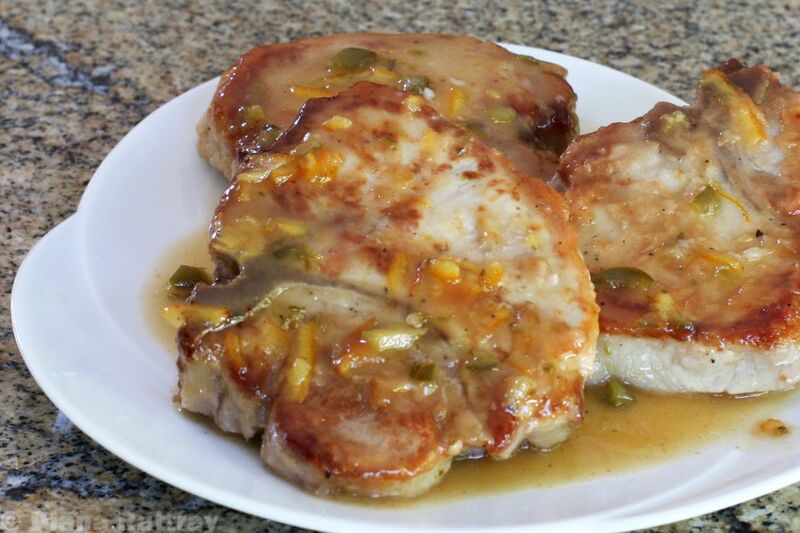 Use jalapeno peppers or mild green chile peppers in this tasty pork chop dish. The sweet orange marmalade paired with the hot or mild chile peppers gives the chops fabulous flavor. If you prefer an even milder dish, use sweet bell pepper. We enjoyed these pork chops with plain rice, but a rice pilaf or roasted potatoes would be excellent choices as well. Add a salad and steamed broccoli, green beans, or a salad, and you're good to go! Sprinkle the pork chops all over with salt and freshly ground black pepper, and then dust them with about half of the all-purpose flour. Heat the olive oil in a large skillet over medium heat. When the oil is hot, add the pork chops to the skillet. Cook for about 8 to 10 minutes, turning to brown both sides of the chops. Remove them to a plate and set aside. Add the butter to the skillet. When the butter has melted, add the remaining flour. Cook, stirring, for 2 minutes. Add the peppers, cayenne pepper, chicken broth, marmalade, and wine. Stir to blend. Cook, stirring, for 1 minute. Add the pork chops back to the pan. Reduce the heat to low, cover the pan, and simmer for about 20 to 30 minutes, or until the pork chops are thoroughly cooked. The minimum safe temperature for pork is 145 F (63 C). *If you use canned peppers or pickled jalapenos, drain them well before adding to the pan. The wet chopped hot red peppers are another good choice for this dish (Goya or Pastene). To lessen or eliminate the heat, replace the hot peppers with sweet bell peppers or mild chiles and omit the crushed red pepper flakes. For a non-alcoholic dish, replace the wine with more chicken broth or use unsweetened apple juice.